Is it a big house on the beach or overlooking a fairway, or a house in a neighborhood that reminds you of where you grew up? Maybe it’s not a house, but a villa or townhome…who wants to mow the lawn with all this other stuff to do anyway? Surely something in there is on your list, but not everybody’s list is the same. The thing is, the South Carolina Lowcountry has all of it and then some to offer, and there’s a neighborhood somewhere around here that matches your personal vision. You’ve heard clarion call from your friends in the real estate business that this is a great time to purchase a home because prices are more favorable to buyers than they’ve been for some years. If you are ready to take that advice any time soon, we’re here to help. No, this isn’t going to be a catalog of available listings or a market report or anything of that nature. You’ll have to pick up the phone and give your realtor a call for that. On these pages we’re profiling local communities in terms of lifestyles and amenities to help you identify where you should be looking if you’re in the market. This month’s installment has a bit of a maritime feel as we spotlight four venerable Hilton Head private communities that all feature either a marina, deep water home sites, or both. 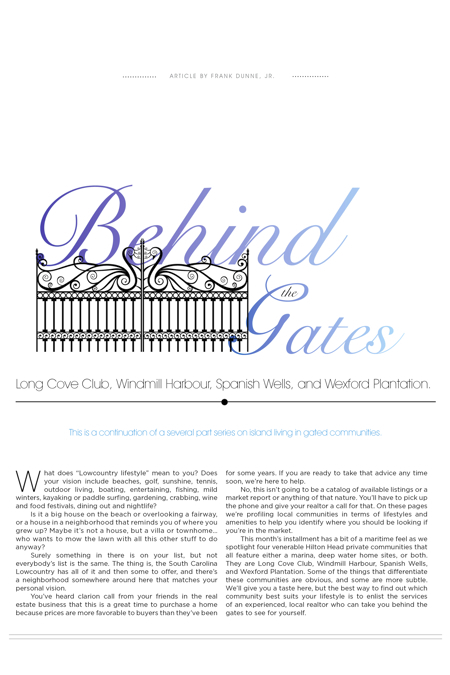 They are Long Cove Club, Windmill Harbour, Spanish Wells, and Wexford Plantation. Some of the things that differentiate these communities are obvious, and some are more subtle. We’ll give you a taste here, but the best way to find out which community best suits your lifestyle is to enlist the services of an experienced, local realtor who can take you behind the gates to see for yourself. A discussion of what life is like in Long Cove Club usually starts with golf, and we will do that here, but speaking to those knowledgeable about the community, you’ll discover that golf doesn’t necessarily have to be the beginning, middle and end of the conversation. That said, even the most die-hard of the die-hard golfers know that all of life isn’t lived on the fairways, and Long Cove Club delivers in that regard as well. Ask John McKenzie of Long Cove Club Realty what—aside from golf—sells Long Cove Club, and he’ll tell you, “Long Cove sort of sells itself. Just take a drive through and you’ll see.” Set on Hilton Head Island’s south end on the shores of Broad Creek, the community pays homage to the Lowcountry’s natural beauty with wooded, water and marsh views suitable for framing. The homes, nestled in with the lush indigenous vegetation, typically exhibit understated elegance with traditional Lowcountry style architecture. A collection of homes ranging in size from about 2,500 square feet to over 7,000 square feet, and in price from under $400,000 to about $3 million, sets the table nicely for a diverse group of neighbors who enjoy active lifestyles, with or without a club in hand. Speaking of clubs, Long Cove Club membership is automatic with home or land ownership in the community, and the soon-to-be-renovated clubhouse is at the heart of Long Cove’s long list of social and recreational offerings. The tennis center features eight courts, four of them lighted, and a year-round schedule of competitive, social, and instructional events. Members can take a dip in the Jr. Olympic sized pool, or exercise their green thumbs on a complimentary garden plot at the Farm. Long Cove is also Hilton Head’s only private residential community with its own dog park. Long Cove Club’s 85-slip marina on Broad Creek completes the Lowcountry lifestyle picture for the community. The marina can accommodate craft up to 35 feet in length, and its docks are very popular with all members for fishing, crabbing, kayaking…or simply enjoying a sunset after cocktails and dinner in the clubhouse. A common sentiment among Long Cove members is an appreciation of the privacy of a neighborhood community, with an abundance of amenities in a self-contained area, while still feeling connected to the greater Hilton Head community. Long Cove’s main entrance is located on William Hilton Parkway, a short distance from the Sea Pines Circle, so members enjoy their privacy and seclusion without being way off the beaten path. “I think they like the proximity to ‘Downtown Hilton Head,’” McKenzie said. 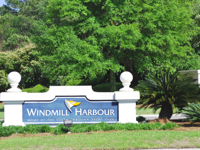 Windmill Harbour is also home to the South Carolina Yacht Club. “The heart of the community is the club,” Richardson said, “and it’s a unique club because it’s not just property oriented,” meaning that membership is not a requirement of ownership in Windmill Harbour, nor is it limited to residents. “It’s a yacht club, it’s a property owners’ club, and it’s a community club, and it’s extremely well run.” The Yacht Club is a major attraction for Windmill Harbour with amenities such as clay tennis courts, a 25-meter swimming pool, saunas, a Jacuzzi, and plenty of social activities. “The Yacht Club was icing on the cake. It’s a great club with amazing food and community spirit,” Laios said. That peaceful serenity, plus the presence of some of Hilton Head Island’s most stately waterfront mansions, can be a bit deceptive. 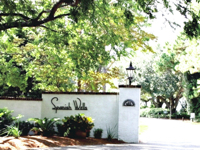 A closer look at Spanish Wells reveals a very friendly, energetic family oriented neighborhood with lots of activity to keep kids and adults entertained. “It’s a true community,” Wedgeworth said, “a lot of families and a lot of kids.” Those activities include golf and tennis at The Spanish Wells Club and a community pool. The Spanish Wells Clubhouse, the island’s only waterfront golf clubhouse, provides an idyllic setting for all kinds of social gatherings against a backdrop of gorgeous Calibogue Sound and May River views. A 100-foot community pier is located behind the clubhouse for fishing, crabbing, or just taking in the views. The neighbors also enjoy special events like a Fourth of July golf cart parade, and a carnival atmosphere that engulfs all of Spanish Wells for trick-or-treating on Halloween night, with some of the wackiest Halloween displays you’ll ever see! Although access by car is limited to a one-lane entrance at the end of Spanish Wells Road, the community’s perceived remoteness is also somewhat deceptive. The entrance is only about a mile from the midpoint access to the Cross Island Parkway, so both the island’s north end and south end are a few minutes’ drive. “The best thing to happen to Spanish Wells was the Cross Island Parkway,” Wedgeworth said. Steve Timperman is pretty excited about some things that are going on in Wexford Plantation. In the interest of full disclosure, he ought to be since he both lives in and sells real estate in Wexford. The biggest news is that Wexford’s nearly 30-year-old golf course emerged from a major renovation project in 2011 as the Arnold Palmer Signature Course at Wexford. On top of that, a clubhouse that underwent a complete renovation of its own in 2010 anchors the course. Those two developments should bring a few people through the gate to have a look, and Timperman anticipates that a lot of them will be surprised by what they see. “It’s a private lifestyle with one of the best golf courses on the island, and if you’re a boater we have one of the nicest marinas on the island,” he said. “It’s also a young and active community, more so than a lot of people may think,” he added, noting that the average age of Wexford residents is 51 years and there are about 140 kids living in the community. 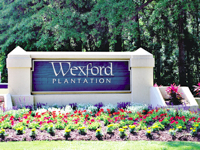 Real estate in Wexford is segmented by four lifestyles. Single family homes on the harbor, which sit on approximately third-acre lots, and single-family golf course homes on approximately half-acre lots. These lot sizes are average to a slightly larger than average for Hilton Head Island. Ideally, second home owners look for something more low maintenance and opt for a patio home or townhome, both of which are available in Wexford. About 35 percent of the occupied residences in Wexford are second homes, but short-term rentals are not permitted so you’re sheltered from the transient nature of the resort trade. “It’s mostly primary residents and second homeowners who don’t want to be near the chaos. Behind the gates it’s just you and your neighbors,” said Timperman. But that’s not to say that Wexford is isolated. 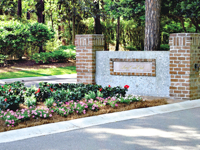 The main entrance is located a short distance from the Sea Pines Circle on William Hilton Parkway. It’s also connected to Dunnagan’s Alley, giving a shortcut to the shopping, dining and services at the Village at Wexford, on Arrow and Palmetto Bay Roads, and quick access to the Cross Island Parkway and the north end. Homes in Wexford range in size from townhomes at about 3,000 square feet to single-family homes as large as 10,000 square feet. Naturally, that sort of variety brings with it a wide dispersion of prices from under $200,000 to $2 million and upward. Architectural styles depart from “typical” Lowcountry and favor more of a British West Indies motif. The harbor features a system of canals that wind through Wexford, allowing deep-water home sites to be situated throughout the community rather than around a single basin. Four of Wexford’s neighborhoods are sited on manmade islands in the harbor and connected by stone bridges. All of these elements combine to give Wexford Plantation a very distinctive signature. Also, the harbor, which can accommodate vessels up to 70 feet in length, is protected by a lock system, one of two on the island and only four on the entire U.S. Atlantic Coast.